On Wednesday, June 13th, 25 children aged 7 to 11 visited CentraMod to learn about modeling and running trains. They visited on the second day of a three day “Train Camp” experience that was offered through the Temple Railroad and Heritage Museum. At the end or their day at CentraMod, the children received a date nail as part of their care package. Railroad tie date nails have a date stamped in their head. For example, a nail with a “41” is from 1941. They are usually 2 1/2″ long, with 1/4″ shanks. Date nails were driven into railroad ties, bridge timbers, utility poles, mine props, and other wooden structures for record keeping purposes. Date nails were manufactured by steel companies on high speed machines, even in the early years. 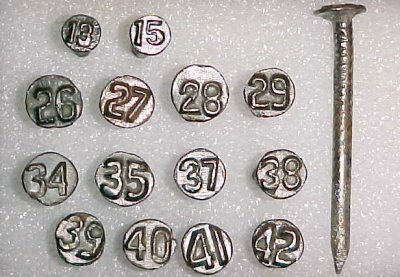 If a railroad wanted to use date nails, they would order the kind of nails they wanted (for instance, a 2 1/2″ x 3/16″ steel nail, round with raised numerals “34”). The nails were driven into ties either at the treating plant to indicate the year of treatment, or at the track to indicate the year the tie was laid. When a rotted or mechanically damaged tie was removed, the date on the nail was noted. Ties were never removed because of age, so date nails did not tell the railroad when to replace ties. Some railroads found that dated ties lasted longer than usual because the men took special care of them. In the first decade of the 20th century, railroads which used date nails drove them into every treated tie. Some railroad found this type of record keeping method to be a failure. Beginning in 1909, some railroads focus on keeping records of special test sections. This method proved to be more accurate and far more economical for these railroads instead of tracking several million ties. However, by the early 1920’s most railroads had returned to the practice of placing nails in every treated tie. Railroads needed a way to monitor their investment in treating, and date nails became the most common method of this record keeping. For additional information, be sure to check out Jeff’s Date Nail Page.